Wednesday February 17 1909 I got up earlier today. I had my working done the house cleaned up and dinner ready on time. I told Will the plan for the house Ed [Kover?] came up to take out the window up stairs and Will took it to town. I told Ed of the plan he will do the work for us. I baked cookies and churned. I read most of the evening. 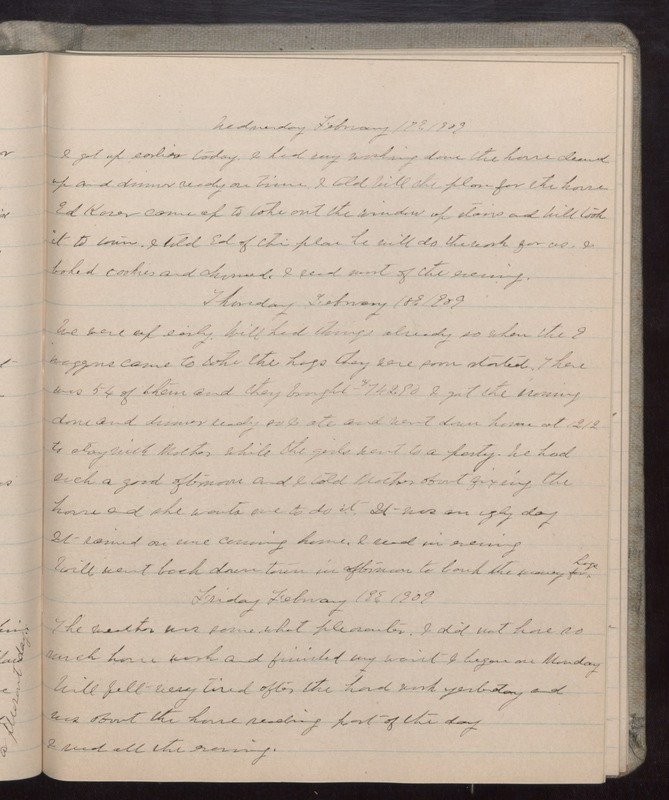 Thursday February 18 1909 We were up early. Will had things already so when the 9 waggons came to take the hogs they were soon started. There was 54 of them and they brought $742.9 I got the ironing done and dinner ready so I ate and went down home at 12.12 to stay with Mother while the girls went to a party. We had such a good afternoon and I told Mother about fixing the house and she wants me to do it. It was an ugly day It rained on me coming home. I read in evening Will went back down town in afternoon to bank the money for hogs. Friday February 19 1909 The weather was some-what pleasanter. I did not have so much house work and finished my waist I began on Monday Will felt very tired after the hard work yesterday and was about the house reading part of the day I read all the evening.